I read about this activity at My Montessori Journey - when I saw that I already owned the book, I knew I could adapt this project for my five year old son. We just love this book! We can make his eyes and a great big smile! Then we’ll be ready for Halloween. Then we’ll be ready for Halloween! You can make up your own tune to the song, or even just use it as a little poem - there is something about it that kids really enjoy. I read the book, then went back over the life cycle of the pumpkin. Then, I gave my son the sheets I had downloaded and printed from here and asked him to color them, cut them, and arrange them in order on the black 12x12 paper. Here's what he came up with - I was really proud of him! Tomorrow we will be cutting and putting together the mini book of "Five Little Pumpkins" - I still remember this rhyme from my childhood! Happy Pumpkins! 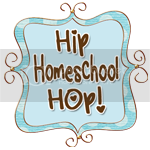 This post is linked to the Hip Homeschool Hop - I love this Tuesday link-up! Go see what everyone is up to this week.